Vaelin Al Sorna is the Sixth Order's newest recruit. Under their brutal training regime, he learns how to forge a blade, survive the wilds, and kill a man quickly and quietly - all in the name of protecting the Realm and the Faith. Now his skills will be put to the test. War is coming. Vaelin must draw upon the very essence of his strength and cunning if he is to survive the coming conflict. Yet as the world teeters on the edge of chaos, Vaelin will learn that the truth can cut deeper than any sword. 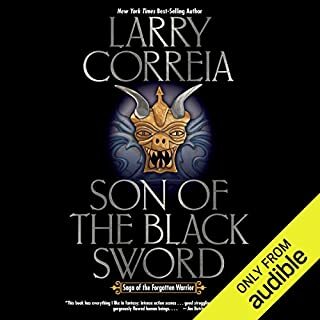 I found the story to be very good, but having just listened through the The Name of the Wind and The Wise Mans Fear, where the narrator gives a stellar performance, the narration in Blood Song was not to my taste. I don't know how many times I had no clue who were talking, past or present etc. If you are able to sit down and concentrate you will most likely be able to eliminate these problems, but for me... I listen while I do other stuff and I lost the thread way too often. I have not had this problem before and I have listened to my share of books. The voice is just fine, although the diction is a bit "slurred", the problem is there is no distinction between the persons speaking, I also had a difficult time noticing when there was a change of scene, some names got mixed up and at times I felt it was read at maximum speed to get theough it. A good narration can lift a book, this is not the case for this one sadly. I strongly recommend the book to fans of the genre however, but I believe I will be going for the good old paperback for book 2. I don't usually leave written reviews for audiobooks I have read, but I felt compelled to do so after finishing Blood Song. The story, plot and characters make up one of the best books I have read for many many years. As the title of this review says, I think it's as good as The Name of the Wind, which is high praise indeed as THAT book is one of my all-time favs. But, but, but....why must there be a but? Because the narration of this book is awful. Just terrible. The problem with audiobooks of course is that you can't see the writing on the page - without looking at the sentence structure, you don't know that two characters are having a dialogue and you can't see where one character stops talking and another character begins. Which is why narrators change their voice to suit different characters. But not Steven Brand. Oh no, Steven reads the book without almost any attempt to vary his voice according to who might be speaking. Men, women, children, dogs, horses, chickens...they all sound the same. Even though I was listening carefully, it was possible to become lost in the dialogue, as you had to try and guess who might have said something. Very challenging. Anyway, it's a wonderful book and I recommend it fully, but if I had my life over again I might have just bought the paperback version and saved myself a lot of frustration (for what it's worth, it is better in the Book 2 audiobook, but still not as good as it should be). It came to me like a song. Loved the narration. Sounded like an old warrior telling a tale around a campfire. It brought me into the story which I already loved. This is the third time I'm listening to it. The first half of the book is pretty forgettable, but it is worth sticking araound as it soon gathers pace into an epic narrative full of interesting & unique characters. The second book is even better. Let down by the narrator. At first I really struggled to get into this book due to the narration. I found Steven Brands voice to be heavily accented, and with an inability to use different voices for different characters. The story was delivered in monotone and I began to suspect that he may have had a cold when he read this book due to a raspiness in his voice. I did persist however and after eventually getting used to the narration enough to be able to engage with the story-line I found the book itself to be a half decent read. Not epic by any means but very readable. Vaelin Al Sorna, prisoner of war relates his story to chronicler and historian Lord Verniers, as he is transported by ship, to answer for his crimes. The story then takes us back to the young Vaelin, and his entry into the Sixth order of The Faith, and so the story begins. We learn of the strict training regime within The Order, the friendships he builds, the trials he endures, and the secrets he begins to uncover. This is a wonderful novel, with a complex plot, interesting secondary characters action,political intrigue, and interesting take on magic. A book that answered so many of the questions that it brought up, that it could be a stand alone novel. But also left enough that. Yup! I'm gearing up to listen to the next book in the series. If you only get one book this year this one would not be a bad choice. My only issue was with some of the narration. Although I loved Steven Brands voice, and yes I thought he was perfect for the voice of Vaelin. I was just a bit disappointed with his lack of distinction, when he was voicing the other characters, there was a few times when I had to do a quick rewind to double check who was talking. I had to really pay attention or would lose track of what was going on. Just a small niggle. But felt it stopped me getting totally absorbed into the story. Why ruin a good story with a poor narrator? This is a very good story and had I been reading it myself then yes it would be 5 stars. I love "The Name of the Wind" and heard this was similar so rushed to buy it with a valuable credit as soon as it was released as an audiobook. Now here is where the problem starts. Its an audiobook and as such is different to just buying a book and reading it yourself. Part of the beauty of an audiobook is the performance given by the narrator. For example, everyone has probably read the Harry Potter books to themselves but the audiobook brings a totally new perspective on the story with the superb Stephen Fry providing excitement and numerous amazing voices for the characters. 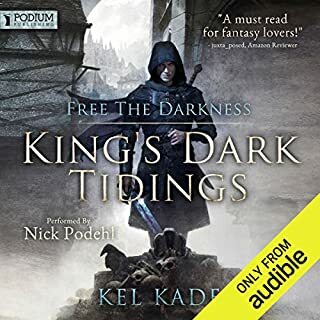 Nick Podehl does this really well with "The Name of the Wind" and Michael Page does an amazing job with "The Lies of Locke Lamora". Now unfortunately Steven Brand does NOT do a good job here. How people can give him a 5 star rating I do not know. Where are the different voices for different characters? Where is the change of tone, tension and excitement for the action scenes? His voice is also too soft for this genre, I expected him to cough at any moment and all to suddenly be OK but alas no. Steven reads this book to you but doesn't perform it. A meeting between Vaelin and one of his brothers is read exactly the same way as a description of a battle. 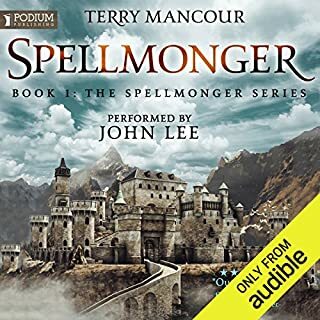 These audiobooks are not cheap if you don't use a credit and it baffles me why the author would allow his hard written book to be ruined this easily. I struggled through to about the last hour then realised I was not going to buy the second part of this story with the same narrator and so stopped - huge shame. If you are happy with someone just "reading" to you then fine buy this audiobook. If you would rather be entertained look elsewhere now, buy the book in hard copy and read it yourself! I’ve been itching to finish this audiobook as I was anxious to post my review and help spread the word. It’s always pleasing to find a new author who can go straight into your own personal A-list. Happily Anthony Ryan falls into that category. His debut novel is a fantasy of the epic order. The main protagonist, Vaelin Al Sorna, is an instant classic fantasy hero and the book is full of other interesting and engaging characters (neither too black nor too white, as befits modern tastes). If you insist on criticism, perhaps the story was a little generic and perhaps the underlying heart of the central conflict was a bit under-developed, but the ending of the novel hinted greatly of an opening-out of the themes in subsequent volumes. Needless to say I am already started on volume 2 “Tower Lord”. 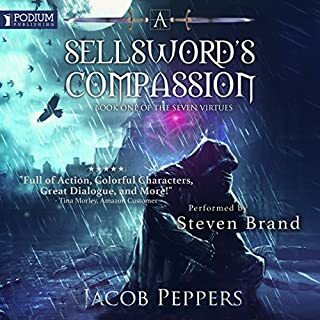 Having seen some negative comments on the narration I have to say I thought Steven Brand was excellent and his voice really fitted the mood of the novel. If you could sum up Blood Song in three words, what would they be? Brilliant book, well worth a listen. It's cut from similar cloth as other novels of this genre - good old sword swinging battles, edged with a bit of magic and mystery, warring realms, gifted hero, nasty baddies....the usual ingredients, but well put together and an enjoyable tale to get into. Reminds me a little of the Wheel of Time. As to the narrator...many reviewers have already commented, and I don't disagree with them. When it comes to narrators, you get two types - those who PERFORM the book and those who simply read it. Stephen Brand falls into the latter category. He does read well, in that he's clear, his pronunciation consistent, and his tone is easy enough on the ear...but that's all; no characterisations. There were occasions when I wasn't clear who was speaking. I believe that the really good "performers" (eg Steven Pacey; Rupert Degas) take an audiobook to a different level ...........how much better would this book have been had it been performed rather than simply being read? Unfortunately my lifestyle means I only have time to listen to audiobooks - sitting still in order to read is not an option - therefore I will probably choose to listen to book 3 even if it has the same narrator. But perhaps this might be a trilogy which would be better tackled in the traditional manner - a good old paperback. If you're a fan of this genre, don't let the narrator put you off; it's not so bad as to ruin the story, you just have to concentrate a little more than normal. Imagine an amalgam of a cleaned up Logan Nine Fingers, a straight Ringil Eskiath and Jorg Ankrath with morals. Vaelin Al Sorna is an extraordinary character: inspiring, charismatic, deliciously laconic, delightfully enigmatic and just... well... all over competent. There's a dab of Left Hand of God in there, too. For all those comparisons, this is a unique, enthralling fantasy. It's truly epic. A quick synopsis: a warlord's son is handed over to a religious order for training as a warrior. Vaelin comes to realise it's for his own protection and forges deep bonds with his brothers. It soon becomes clear that there are forces at play - an unknown order, leeching evil and the ambition of ruthless people. There are many threads winding through the story - you'll be jumping up and down for the release of book 2. The mystique of the Brotherhood is beautifully depicted. The brothers' training is fascinating and the resulting super warriors are captivating. The characters are complex, compelling people and Ryan handles relationships with a sure but delicate hand. This little gem is a bit of a slow burner but well worth the wait. Taking us from the early years of a young, confused boy growing up in a religious order of warriors, the author slowly but masterfully paints a picture of a fractured land steeped in war with many religous factions willing to fight and die for their beliefs. Throughout the book we are teased with broken pieces of information about an ancient order of men thought lost to the centuries. Our anti hero travels across land and sea to try and uncover the truth, fighting countless battles and forging new friendships along the way. The main thread of the story in underpinned with intriguing subplots and facinating characters making this, on the whole, a great listen. We get to hear the true story. What about Steven Brand’s performance did you like? He narrated it really well. Looking forward to hearing more of his work. Looking forward to Tower Lord and a massive thank you to Anthony Ryan for sharing such a fantastic story. What did you like most about Blood Song? The bond of brother hood portrayed and sustained through the book. was a pleasure to listen to. there wasn't one scene that stood out to me in this book. It was a god overall listen with many great scenes. If I could stay up 24 hours I would of considered it. If you like name of the wind, or the magician/ wheel of time /sword of truth series you will enjoy this book. Yes. 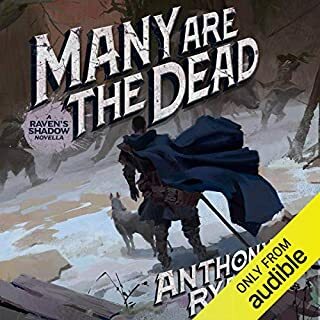 I will probably re-listen to the first 2 books in the series before the 3rd installment is released, but also just because it was a brilliant audiobook. The characters and the depth of the story being told. It fit very well with the tone of the story, and the performance was consistent and engaging throughout. This story has a similar kind of feel to Game of Thrones, but isn't like it, and to be honest, I actually like it better. It's so creative and complicated and the characters are fantastic. Looking forward to getting into the next one! had a hard time getting into this one. hard a hard time keeping track of what was happening. not sure if it was the story or narration. i found it more interesting about half way through. Must admit, the narrator nearly made me stop before it began, the flat tone in which he spoke and lack of voice shifting for characters kept me from immersing myself within the story. But as the story continued, I found that the dialogue started getting peppered with character as the narrator found and fleshed them out. The story is well worth waiting for this subtle shift, and doesn't let up thereafter. Well woven with a good plot twist at the end that made me hunger for the next book. 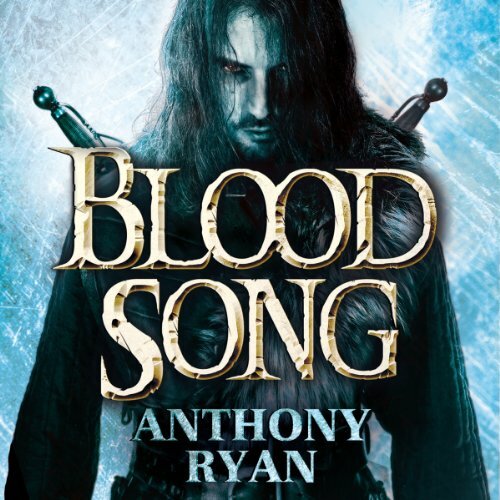 Blood Song is simply breathtaking unique ride into the world of Anthony Ryan..Once you start you can't stop. Intelligent narrative beckons and "What happens next " grip you so tightly its hard to let go. I love everything about it. Its definitely in my top 10. Give it a chance, you won't regret it. A husky narration of a boy entering a brotherhood of warriors who protect the realm. With his hidden dark gift of blood song, he is swept along in life, hunted by others. 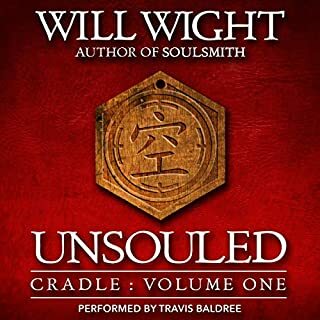 Becoming the Warrior of the realm and order he weaves a life story of murder.killing.and assassination and hidden faiths that unravel to show the dark gifts within others as his blood song evolves. very intriguing and a great story told. will get the next book . A must read .would make a great movie.